Ulm is a town at the edge to Bavaria in Baden-Württemberg, south west Germany. It is home to the highest church steeple in the world (161.53m), even higher than the Cathedral (Dom in German) of Cologne. With a population of 118,000 inhabitants Ulm forms an urban district and administrative center of the region. Ulm, founded around 850, is rich in history and traditions as a former Free Imperial City (German: freie Reichsstadt). Today, it is an economic center due to its varied industries, and it is the seat of a university. Internationally, Ulm is primarily known for having the church with the tallest steeple in the world (161.53 meter or 529.95 feet), the Gothic Ulm minster (German: Ulmer Münster) and as the birthplace of Albert Einstein. Ulm lies at the Danube river and is surrounded by forests and hills which rise to altitudes of over 620 metres, which are part of the Swabian Mountains. Because of the Danube Ulm sees a lot of dense fog especially in late autumn and early spring. Most parts of the city, including the old town, are situated on the north-west bank of the Danube. On the other side of the river lies the twin city of Neu-Ulm in the state of Bavaria. Around the city, there are many statues of sparrows (Spatzen). Spatzen is a nickname for the residents of Ulm and a symbol of the city. Legend says that, while building the cathedral, the workers couldn't figure out how to get the long wooden beams into the church until they noticed a sparrow entering its nest while holding a piece of straw lengthwise, instead of sideways. Standard German is understood by everyone, but the local dialect is Swabian (Schwäbisch). The 48.49.9833331 Ulm Hauptbahnhof (main station). is in the town center, about a 10 minute walk from the cathedral (Ulmer Münster). Ulm is about an hour from Stuttgart and 1.5-2 hours from Munich. There are special train tickets called Länder-Tickets for travel within a region, such as Baden-Württemberg or Bavaria (Bayern). With this ticket up to five people can use all regional trains for a whole day for only 22 € (one person) – 38 € (five persons). Prices may change, so check the Deutsche Bahn website for the latest prices. From these airports you can take the ICE or IC train to get to Ulm. Munich Airport (MUC IATA) 150km from Ulm, about 2½ hours by train. The airport has an S-Bahn station, which connects to other Munich train stations. Frankfurt airport (FRA IATA) is a farther away than all the other listed airports, but may serve as your entry point if none of the closer options aligns with your plans. Deutsche Bahn and most airlines have entered rail air alliances to offer combination tickets for the train ride and the flight in one package, which might work out to be the cheapest and/or most comfortable option. Ulm is near the intersection of the A7 and A8 autobahns. The town center is small enough to walk around, but there are lots of buses and even sightseeing boats on the Danube (Donau) River. There's a Straßenbahn of a single line with a second line to open in December 2018. 48.398519.991891 Ulmer Münster, Münsterplatz 1, 89073 Ulm. Construction on this Gothic cathedral began in the 14th century, but the current version was only fully completed in 1890. The interior of the Münster contains gorgeous choir stalls by Jörg Syrlin (1469–1474) from the 15th century. The top of the steeple, which is the tallest in the world, can be reached by climbing 768 steps and offers an amazing view of Ulm and the region (4€ for adults). On clear days, it is possible to see the Alps. 48.396689.992744 Library. The library of Ulm, also known as "Glaspyramide" (glass pyramid), because of its architecture. Narrensprung. The annual parade at the beginning of Carnival season. Schwörmontag. A town festival that includes the serenade of lights, the historic oath and the Nabada, a water parade in the Danube (Donau) river. Every year on third weekend in July. Christmas market. On the plaza in front of the Münster. Farmers' Market. Om Wednesday and Saturday in front of the Münster. The UlmCard is available from the Tourist Information office. 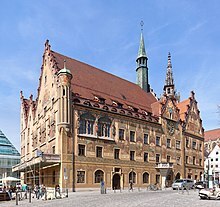 It provides entry to the Weishaupt Gallery, Ulm Museum, Museum of Bread Culture, Danube Swabian Museum, Edwin Scharff Museum, Museum at Wiblingen Monastery and Rococo library, Natural History Education Centre, and Children's Museum Neu-Ulm along with many other advantages. 48.400969.990077 Museum of Bread Culture. In the Old City, dedicated to the 6,000-year history of bread. 48.397449.993858 Kunsthalle Weishaupt (Weishaupt Gallery). A modern art museum. 48.397129.994759 [dead link] Ulmer Museum. Containing ancient and modern art, including the world's oldest zoomorphic figurine. Walk along the Donau (Danube) river and the city wall and through the Fischerviertel. Visit the many art galleries there. See the Schiefes Haus (Crooked House) and enjoy the nice and little houses with very little streets between and small rivers. Visit the birthplace of Albert Einstein. Today the site of the house where he was born is marked with a memorial. Take a cruise on the Donau with the historic ship 'Ulmer Spatz'. Regularly tours during summer. Starting near the Metzgerturm. The major shopping street starts at the train station and leads directly to the Ulmer Münster church. There are plenty of places to eat in the nice and quiet Fischerviertel, where you can get some genuine German food and beer. 48.39539.9904021 Zur Forelle, Fischergasse 25, ☎ +49 731 63924. Very good German fish and meat dishes. Hemperium, Zinglerstraße 1, ☎ +49 731 30200. Restaurant/bar where various meals made from the (impotent) male hemp plant are served. Prices are very attractive and food is good. Kornhäusle, Kornhausgasse 8, ☎ +49 731 1517311. A cozy small restaurant which serves crèpes (yummy salty French pancakes), also very nice. Gaststätte zur Stadt Heidenheim (Oststadt). Big meals, Biergarten during summer. Barfüßer, Paulstraße 4, Neu-Ulm, ☎ +49 731 974480. The Barfüßer restaurants brew their own beer. There is also one Barfüßer beer garden directly at the Danube. Murphy's Law, Keltergasse 3, ☎ +49 731 6021467. Murphy's Law is an Irish Pub. Schlössle, Schlössleweg 3, Neu-Ulm, ☎ +49 731 77390. The Schlössle is perhaps one of the nicest beer gardens and can be reached within a 15min walk from the city. They also serve their own beer. 48.4017939.9872381 Hotel ibis Ulm City, Neutorstraße 12. Basic hotel but clean, not too expensive and close to the centre. 48.3956219.9911592 Hotel Schiefes Haus, Schwörhausgasse 6, ☎ +49 731 96793-0. Very nice, but also very expensive. Breakfast included. 125-148 Euros. 48.3991339.9918073 Ulmer Münster Hotel, Münsterplatz 14, ☎ +49 731 55218674. Check-in: 3 /9/2012, check-out: 5/9/2012. Located next to the Münster. The Ulm tourist office, located in the Stadthaus in the Münsterplatz, is very good. There are many pensions in the old town whose owners do not speak English well and prefer the office to act for them. The old town on its own is worth the stop with some excellent stuben. You can get free internet access at the new Stadtbibliothek (city library), next to the Rathaus (city hall). They have about 30 PC there. WLAN (Wi-Fi) is also available there. This city travel guide to Ulm is a usable article. It has information on how to get there and on restaurants and hotels. An adventurous person could use this article, but please feel free to improve it by editing the page.